Dust, drama and a big dose of excitement. Embarking on a knock-through in your home, while you are living in it, can certainly be one of the most stressful things you will do and if you don’t plan it right, it can be very costly too. So we are here with some top tips to get you through with a smile on your face and enough budget left over to buy yourself that light you have been dreaming of, or at least a nice bottle of wine to celebrate. Who are we kidding, if you had a contingency, well done you, you have already made it past the first hurdle as these things always take slightly longer and cost slightly more. So that contingency is perhaps used up, but at least you aren’t eating into your interior budget, so you can still get the table you had planned. 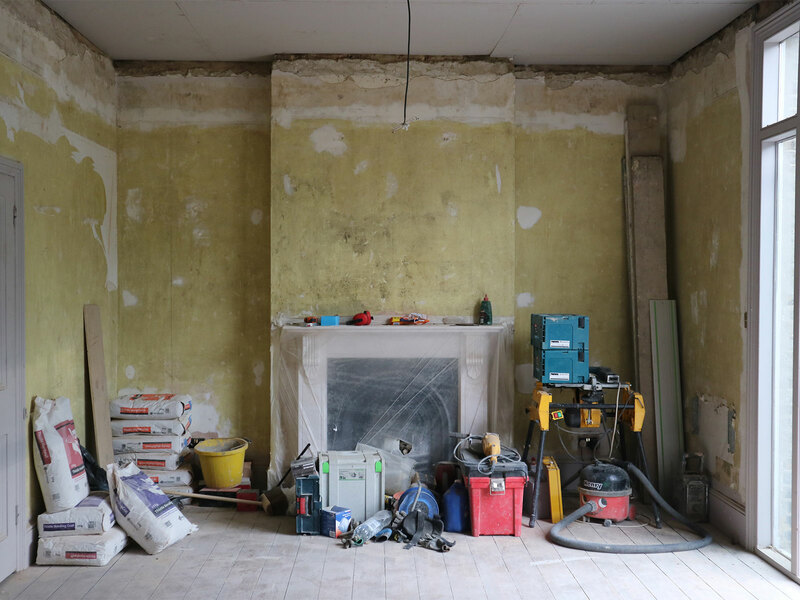 Read on if you want to know the nitty gritty of our knock through and our top tips to help you do yours with the least amount of stress. First of all a warning. 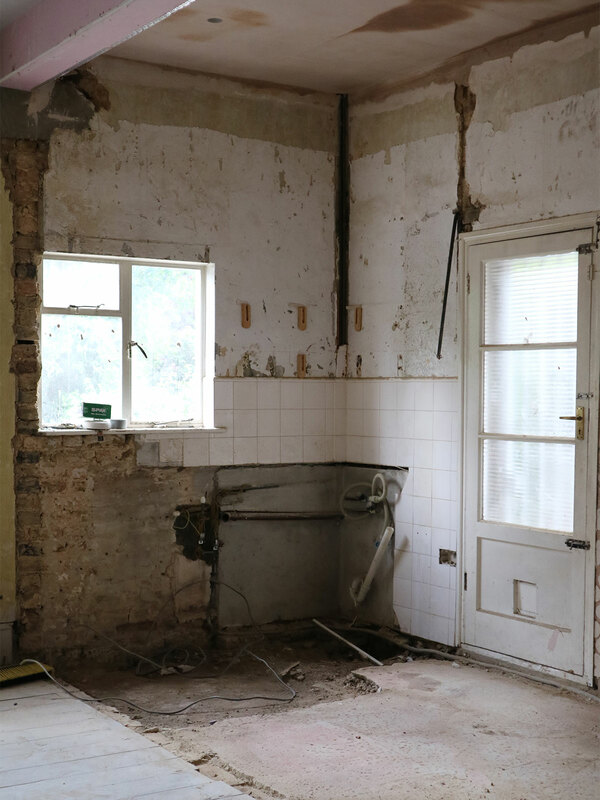 THIS POST IS NOT GOING TO BE PRETTY… but hopefully the excitement of seeing some walls smashed out and 3 spaces opened up will get you into it. Or maybe you are like us and have a geeky passion for a bit of rubble and mess because it means you have begun something wonderful. Strange as it is to say, bringing down walls is one of those phases in a renovation that moves all too quickly. I know, surely we want it move quickly?! Well, yes of course, but in the same breath there is a touch of sadness at each moment as you let go of one phase and move on. 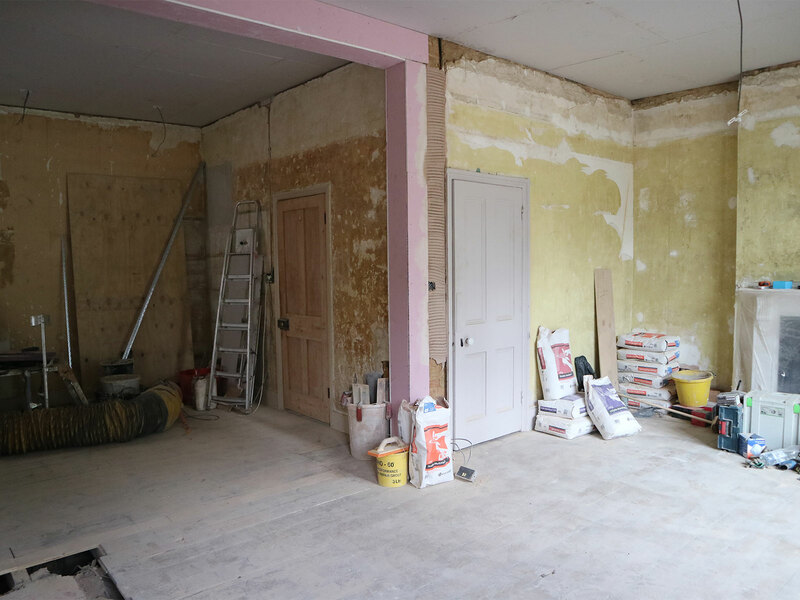 Only a fleeting moment, but it is there, and then comes the smash of excitement about the next layer going in and each day getting closer to that end result of the room you have been designing and planning and dreaming of, in our case for 3 years. It is a bit like when people say, “don’t wish away the sleepless nights and baby years because they will have passed all too quickly and then you will miss them”. Not that we have kids (although Buckley is blatantly our baby). Anyway, you get the gist. 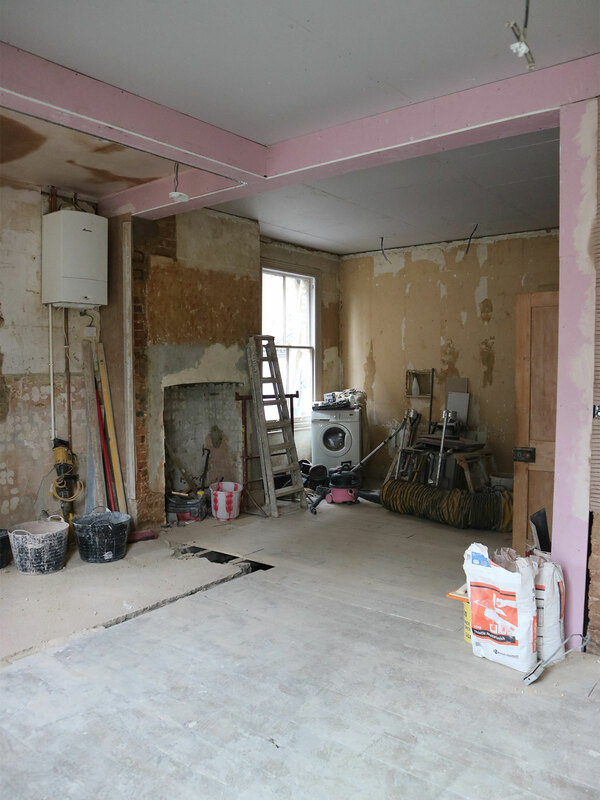 So we are documenting all the phases of our kitchen/diner/office knock-through and will be keeping you posted on all the details that may help you in your own renovation. Giving us a digital timecapsule of the process, with all the phases captured for us to enjoy. 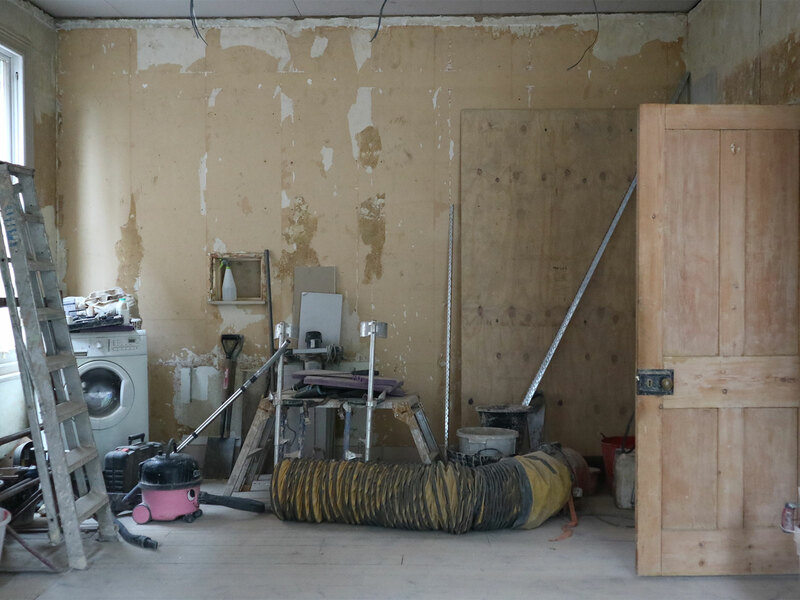 This first phase involves the taking down of walls and we wanted to share with you that most dusty of phases to pass on what you need to know should you decide to smash through some walls of your own at home. 1. Dust - in your food, in your pants and on your carpets. How to stay on top of it and not let it take you over. (not sure if we have mastered this one, but we have survived, so here is how we approached it). We had a side access so we sealed off the entrances to the spaces from the rest of our house. This helped, but one issue was the gaps between the floorboards upstairs as a lot of the dust travelled into the upstairs rooms through the gaps. You can put down sheeting to stop this but you will never quite manage to catch it all. We also hired a dust extraction unit, well our builder kindly did, and that really helped keep the dust outside, but then we had a very dusty herd garden out the back. Haha. See, the dust will get you one way or another. So embrace it. It is only a moment in time and there is a joy when you reclaim the spaces and clean it all up. In the end it becomes funny how dusty you are. Try to go with the comedy value and laugh, don’t cry. 2. Real Steel - Do you need it, how much do you need and how will it look? This is not somewhere to mess around. Get it right. You may need steel for a load bearing wall, or it may just be a stud wall and then you don’t need steel to take its load. Either way you should get a pro to check it out and take their advice. But also, be aware the a structural engineer will not necessarily be thinking aesthetically, they will be making sure the building stands up and so it is up to you or your architect or your designer to make it look beautiful. Things to consider are whether you want it completely open and therefore will it require a larger steel so that you don’t have to have pillars or columns or brick piers eating into your space. Also, how do you feel about visible steels on the ceiling? We have great ceiling heights so this is not a problem for us, but if your have lower ceilings you may want to consider putting the steel up into your ceiling, a more costly approach but it will give you a seamless result. 3. Get the professionals in to get the bones right - Structural engineer and Architect. These are your first port of call with any knock through. Get the professionals to measure and survey and draw up what you need structurally. This is the key to creating the space you want safely and successfully. Get this phase right and the you will have a strong structure to work with. Often engineers will go OTT with the amount of steel you need and you may be able to negotiate with them on how you want the end space to look so that they are putting the steels in places that work for your intended layout. Ultimately though, they are the ones that have to be sure you will have a safe home that will be solid and so you cannot bypass them and you wouldn’t want to. You need to work with them to get as close to what you have in mind as possible. More open usually means more steel and more expense so get it right in this planning phase. One of our most asked questions is, “who is your contractor?” because it is always so hard to find a good one. We do have contractors and builders that we work with regularly but this often changes due to timings on projects, so we work with a variety. 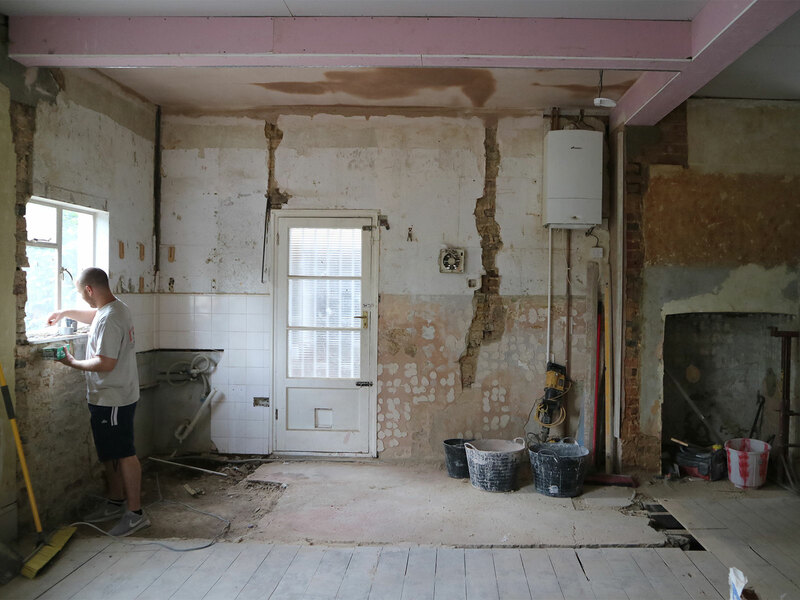 It is hard to find good ones, but it may help to use your local forum website or in our case we actually found our contractor on Forest Hill Mums. They all raved about him so we thought yes please. Our usual contractor was working on two of our other interior design projects for our clients, so we couldn’t have him on our house. But it turned out great because there is nothing quite like a local recommendation. It is a good idea to visit a site of your new builder too. One final note, be aware that there is a difference between a contractor and a builder. Contractors will charge more for finding and planning timings on different trades (ie electricians, labourers, plumbers, plasterers) whereas builders are more likely to just tackle the knock through and steel installation. They may recommend other trades but this is not necessarily their job. And it will be up to you to co-ordinate unless you have a project manager. 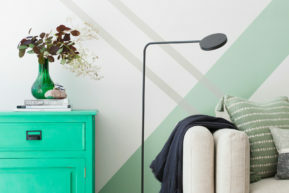 We tackled this co-ordination ourselves and opted to work with a builder. But if you are unsure you may want to hire an interior designer to project manage or at least get a contractor to bring in all the trades. 5. 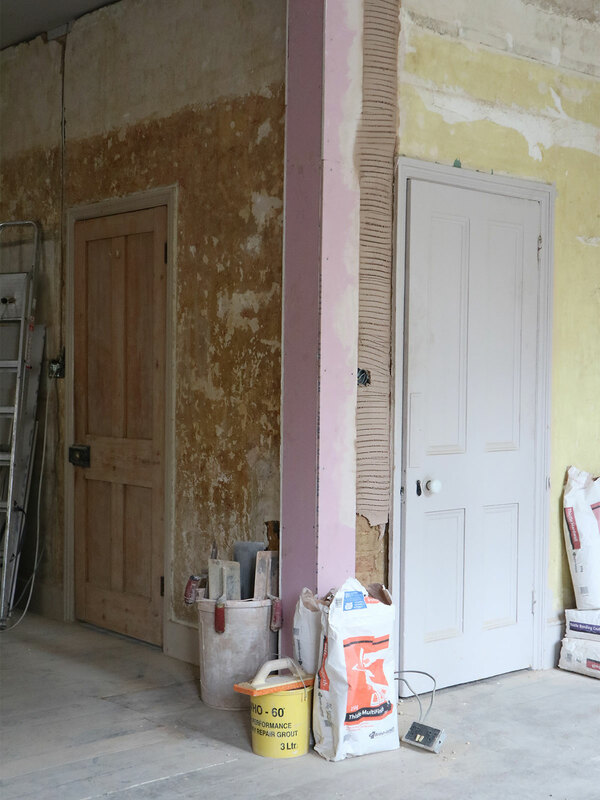 Knock on effects of a knock through – floors, coving, plastering. Taking out a wall is not just going to impact on the area they are removed from but also has a knock on for the other finishes around the room. 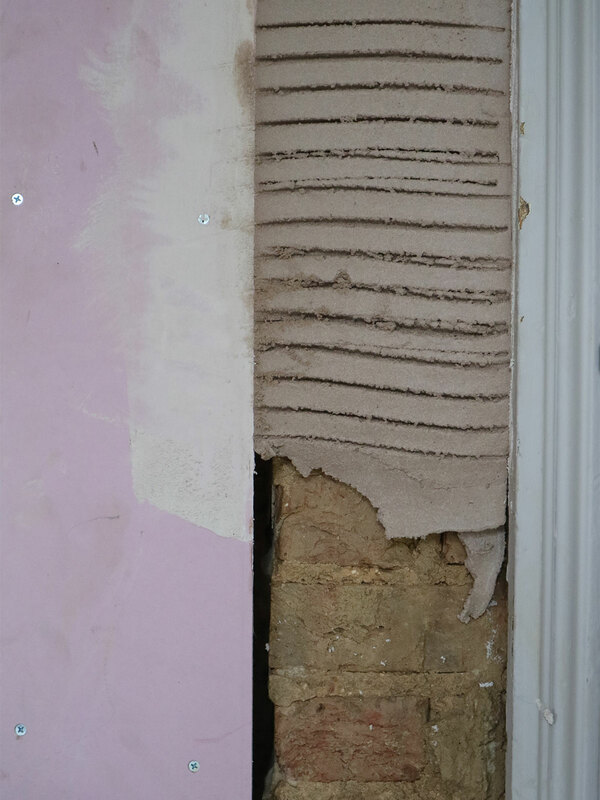 If coving is removed on the wall that goes, do you remove it all around the room and if so does that mean you need to re-plaster all walls and ceiling? 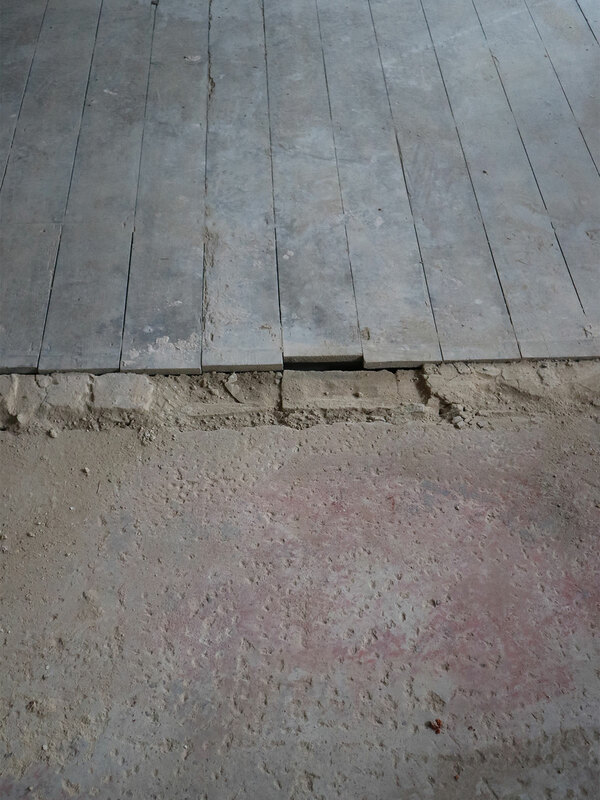 If the floor is damaged or absent from where the wall came out, how will you patch it in or will you be putting in an entirely new floor throughout the space? These are the sorts of issues that can throw up budget issues and open a can of worms. When we took our old kitchen wall out we found that the floor area in there had concrete under it not wood like everywhere else, so we had to take some of our contingency to dig out that concrete and re-level it. We had forseen this and had a contingency, but it was costly. We are having a new floor throughout luckily, but if we had intended to keep the other wooden floors this would have been even more problematic to patch in seamlessly and on the same level. Try to look aead for these hidden costs/issues. You can’t catch everything but try to go in with your eyes open. You don’t need planning for an internal knock through, but you will need to submit a notice to your local planning department at your council and you will need to have a building control officer to sign off your plans, then sign off each phase of the build on site. You can organise these visits as and when you need them at particular stages dictated to you by your allotted officer by calling your council. The Building Control officer is not someone to be afraid of. They ultimately just want you to have a safely built space so they are on your side, even if it doesn’t feel like it sometimes when your budget is stretched to the limit because of an unexpected concrete foundation that needs to go in. Fire safety will also be on their radar, so you may have to have fire doors in your space for example, but again, this is important as it is for your own safety so don’t be afraid of this. And the pink fire board that has to be used to cover the steels is a really cute shade so there is a bonus! Get it right and it will set your renovation off to a great start. Good plastering helps the decorators and the kitchen fitters and the tilers so go for a good plasterer. Don’t go for the cheapest option here. It is a false economy. Good walls will mean less prep for your decorator (or you if your are painting it) and less hassle when installing the kitchen as straight walls mean easy installation. 8. Survival tactics - for those of us living in the middle of it. Washing (laundry and plates), Eating and generally staying happy whilst being invaded by endless trades in your home. Have a plan in place for living without a kitchen. We have no Washing facilities while this is going on so we are using a pick up and return washing service for the few weeks of the build. Food wise, we are living on salads and microwave meals and a fair few deliveroos. It is only for a few weeks and trying to cook in this mess is one step too far. We have also made our bedroom a sanctuary while it is all going on. We can make coffee in there, and we keep it the one dust free zone in the house. This has been our saving grace. Simple things, but they really have made the difference. Coming soon will be our guide to floors and doors, choosing colours and tiles and tips on designing your dream kitchen. Stay tuned for all the updates with a before and after reveal when it is all done.